On a sunny weekend in Scotland’s capital city, a deluge of tattoo artists and enthusiasts descended onto the famous Corn Exchange venue for the eighth annual Scottish Tattoo Convention. Crowds of ink wearing attendees piled through the doors all weekend to feast their eyes on some of the world’s best artists doing their thing, and many of them picked up ink of their own. In all truth, it was a first for yours truly. 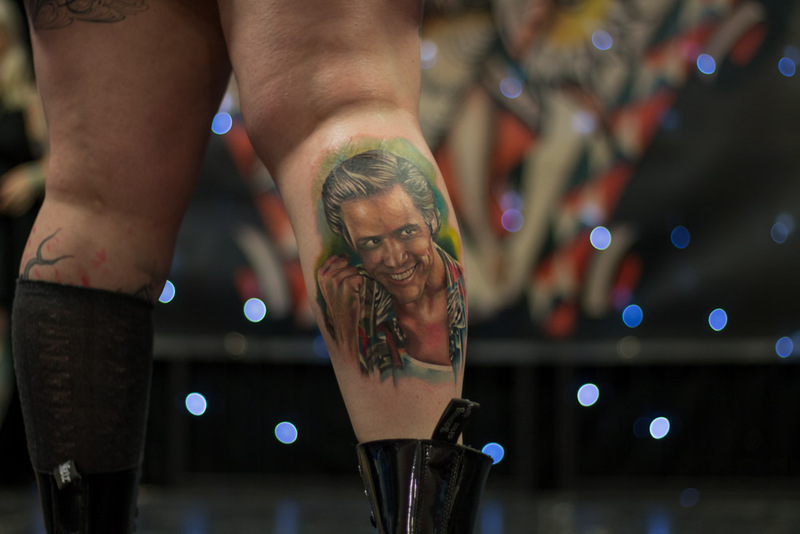 The Sunday of the Scottish Tattoo Convention would be my first taste of the now famous celebration of art that it has become. For some, an event like this could be incredibly intimidating but as soon as anyone crossed the threshold, the event and venue staff, with their big smiles and helpful attitudes, made everyone welcome with a smile. Scottish hospitality – with helping hands from all around the world – made this the fantastic event it always promised to be. Missing the Saturday was a crime I have punished myself for greatly, but this is a celebration of the event so let’s not dwell on it. 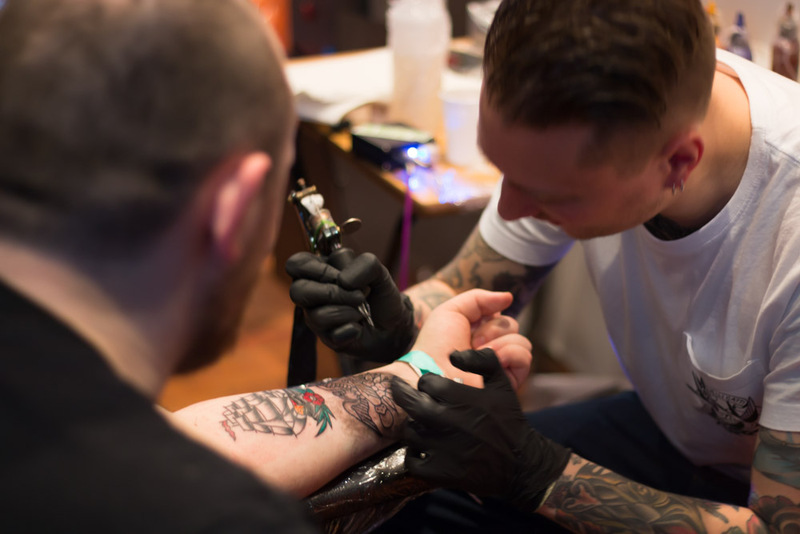 The buzz around the event on Sunday was immense but the Saturday was all about the tattoos. Every artist I spoke to barely had a chance to catch up with what was going on as people cleared them out of flash and designs. 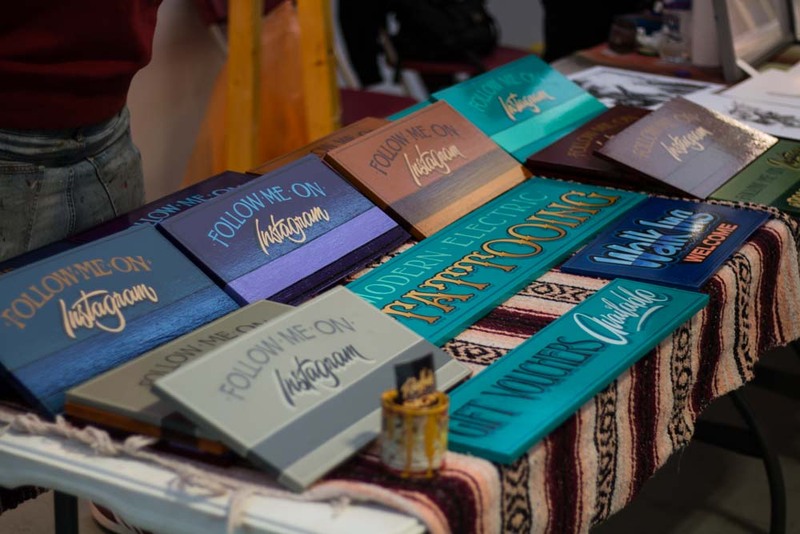 This was more than apparent on Sunday as scores of people wandered around with their newest additions on display. The sound of multiple tattoo machines working all at the same time music to the ears of everyone in attendance. As soon as you got through the doors of the Corn Exchange, the air was buzzing with a good-hearted vibe. Vendors selling high-quality prints and etchings, fiery and delicious hot sauces, and a barber studio giving everyone the freshest cuts all contributing to the hubbub and communal feel to the entrance to the event. 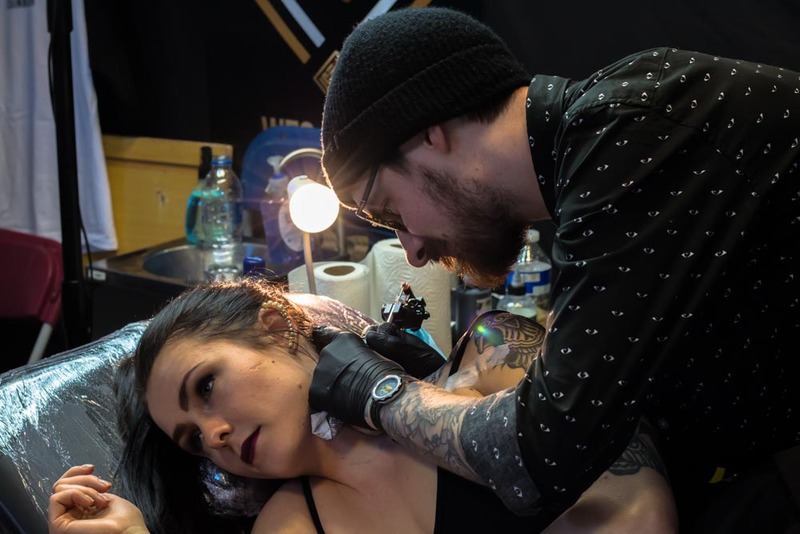 A feeling that was visible on every face in the building, save for the faces of anyone getting tattooed in an awkward place like their armpit, hand or head! The venue staff were exceptional too, making sure everyone knew where they were going and managing to keep a thirsty crowd well quenched. All of this contributing to making the eighth Scottish Tattoo Convention running smoothly and most importantly, putting the visitors first. Aside from a few tired faces later in the day, the event was packed with the beaming faces of the next generation of tattoo owners and, potentially, tattoo artists. 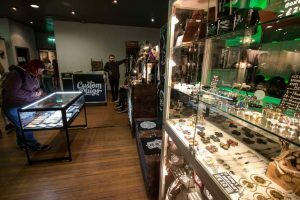 Families wandered through the aisles of whirring machines and maestros at work, with many of the children mesmerised by the work on display. 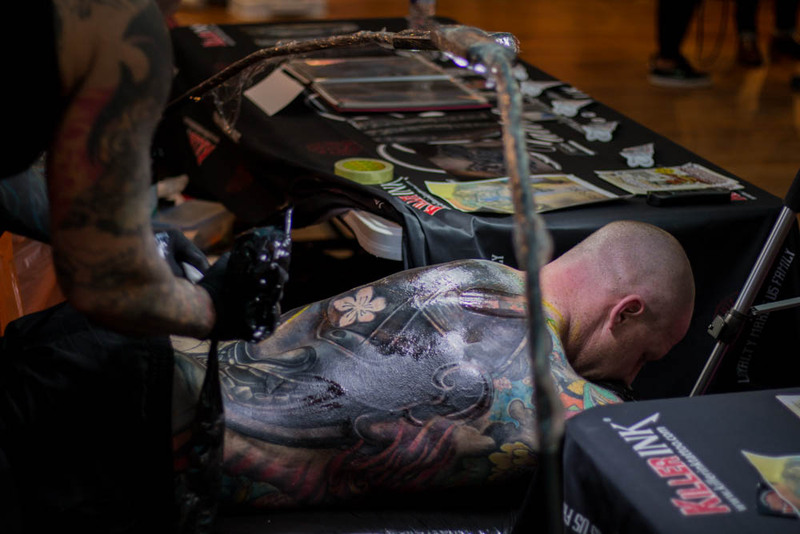 It was totally refreshing to see, knocking any of the old stereotypes of tattooed people straight on the head. 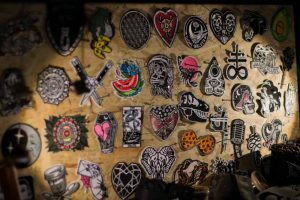 There’s no better environment for youngsters to learn about not judging someone on how they look, what they wear, or what they have marked permanently on their skin. 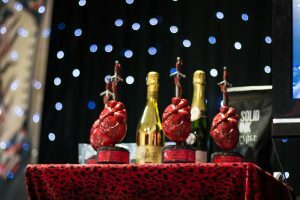 Longstanding event MC Pedro helped make everyone feel welcome and included when running this Miss Scottish Tattoo Convention contest, inviting several kids up to participate as well. 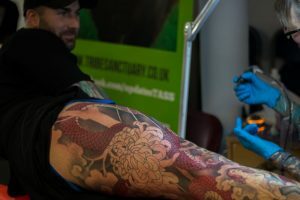 In other circles, it might be seen as a flat gesture, but at an event like this, it stood to show how inclusive and judgement free tattooing is. Outrageous and delightful performances from pinup and burlesque artists like Mini Blue and Kimi Kaos, and the dastardly, death-defying antics of the Death Do Us Part Danger Show kept the audience fixated on the stage – between periods of staring at all the gorgeous art being created on human canvases. 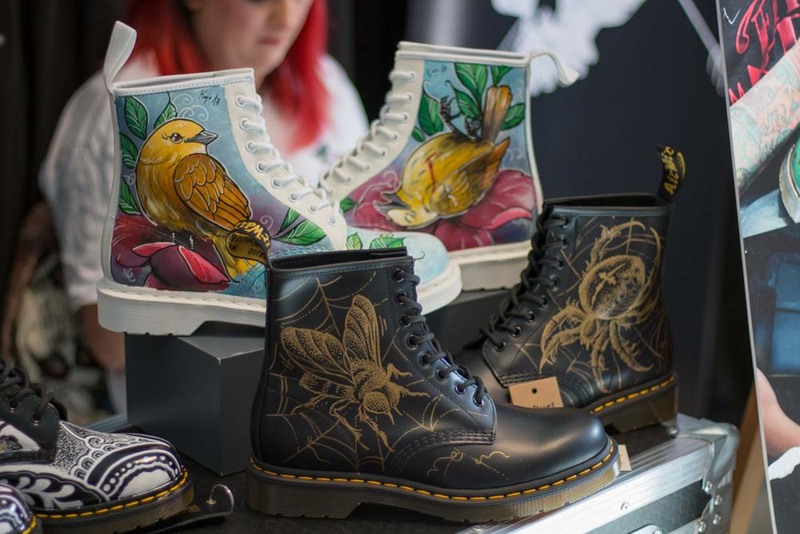 The Dr Martens raffle also brought the attention of the crowd, with several pairs of boots customised by artists from the convention given away to the lucky winners. The buzz of the attendees, moving in waves between booths, artists and vendors was electric, and again showed why the Scottish Tattoo Convention is one of the best. The organisers kept the flow of traffic between areas seamless, making sure anyone in search of a bite or a pint would not go without. 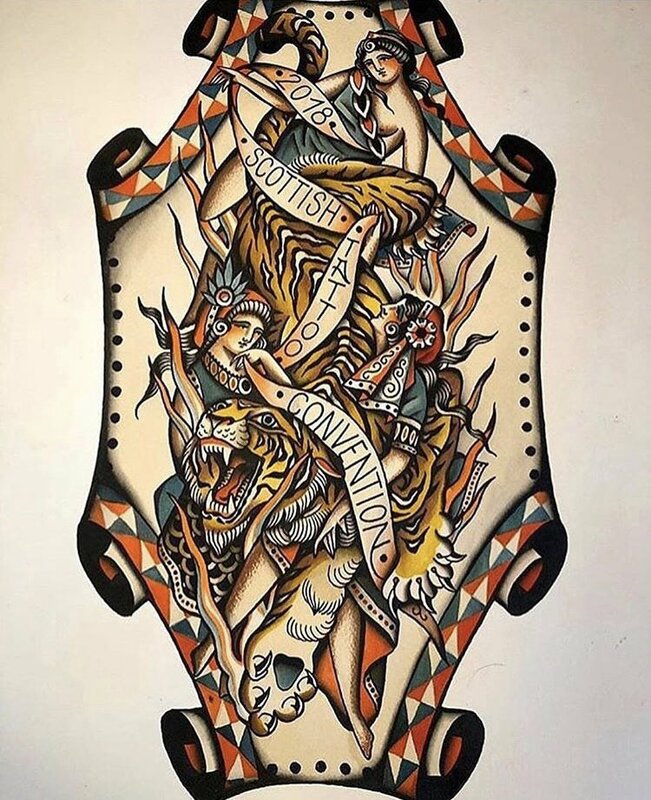 It would be ridiculous to not mention the actual artists involved, but it would be impossible to name check everyone who committed amazing work on skin. UK representation was high but the convention welcomed plenty of artists from overseas. There was a noticeable amount of artists specialising in traditional styles, with neo-trad, blackwork and new school also very well represented. 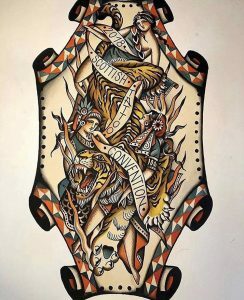 As to how much that says about the current “trending” styles in tattooing? Who knows. The representation of styles, designs and techniques was still so wide that it was difficult to move too far without stopping and chatting with people about their work. 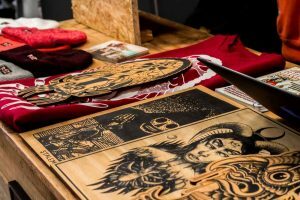 All of the artists were receptive to questions about their work, even while working, and many allowed people to get a real close look too. 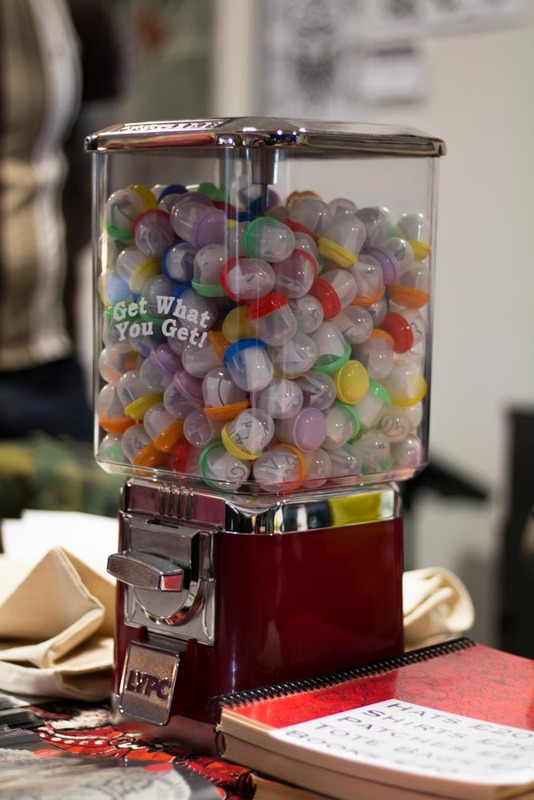 Furthering the friendly atmosphere of the whole event. 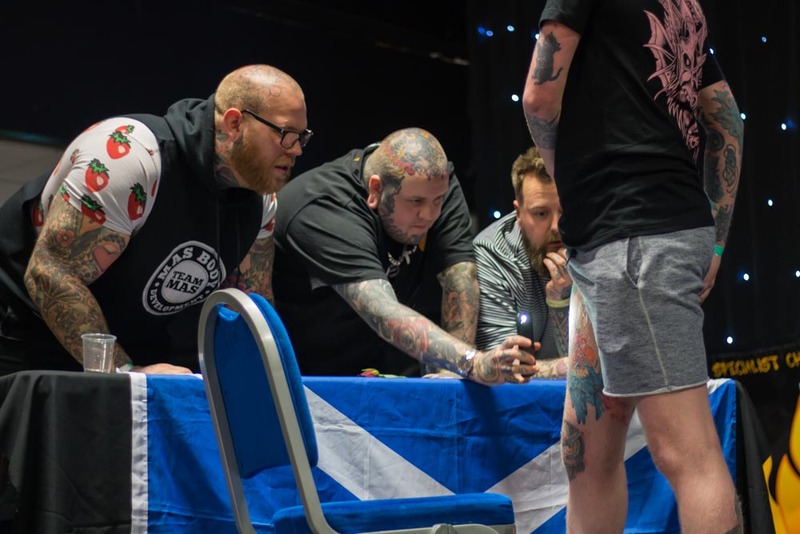 The competitions brought tattoos of all sizes, styles and designs with the “junkie pigeon” that won Best Scottish tattoo bringing a hearty laugh from everyone in attendance. 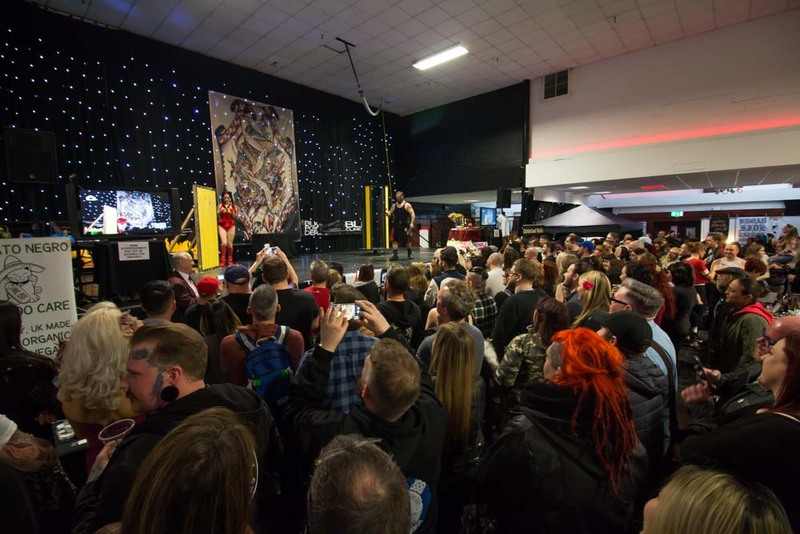 Approaching a decade of events, the Scottish Tattoo Convention maintains its status as one of the most relaxed conventions, without ever faltering in the quality of artists, entertainers and vendors they bring to the Corn Exchange, year after year. 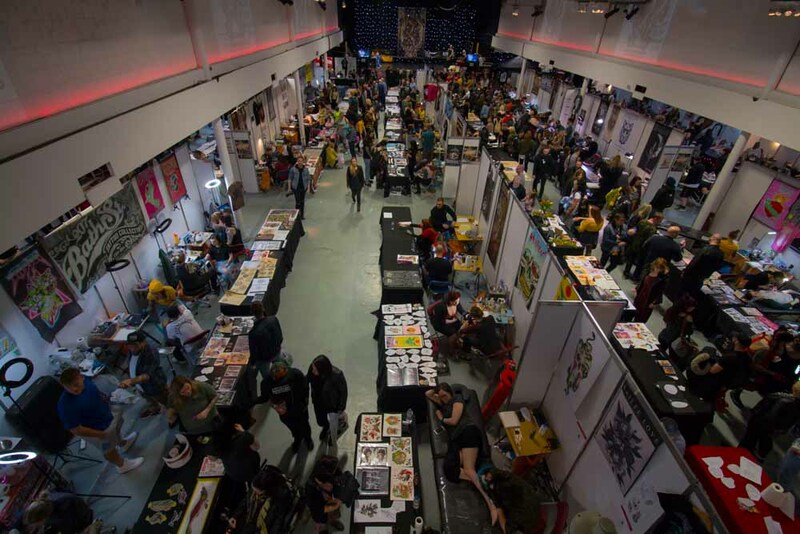 Next year should find the famous venue crammed full of fantastic artists, friendly faces and more gorgeous ink on display than the eye can handle. To anyone thinking about attending for the first time – do it.